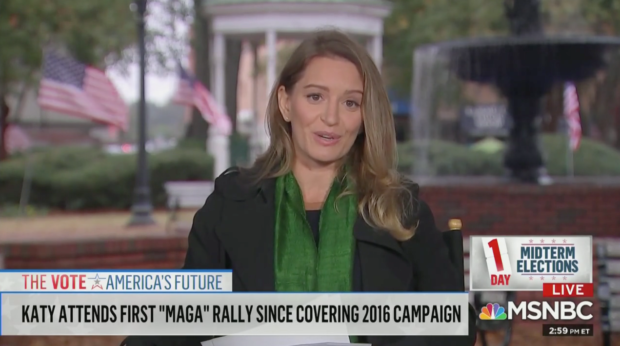 MSNBC’s Katy Tur laughed her way through interviews with Trump supporters on Sunday and admitted afterward that viewers may be “snickering” at the people she spoke with. Tur attended a Trump rally in Macon, Georgia, on Sunday and interviewed two Trump supporters on their views about the media and whether or not Trump is a liar. “You don’t believe the news? You don’t believe the mainstream media?” Tur asked one of the Trump supporters. After the man revealed that he gets a lot of his news from Fox News host and Daily Caller co-founder Tucker Carlson, Tur cut back to her live shot. “Ladies and gentlemen, we have a problem — as Americans, we can’t have our own facts. We can’t just watch one channel because we like what they say,” Tur said. “I can almost feel a lot of you snickering at home — snickering at those two Trump supporters,” Tur admitted, before adding that liberals sometimes retreat into echo chambers, too.